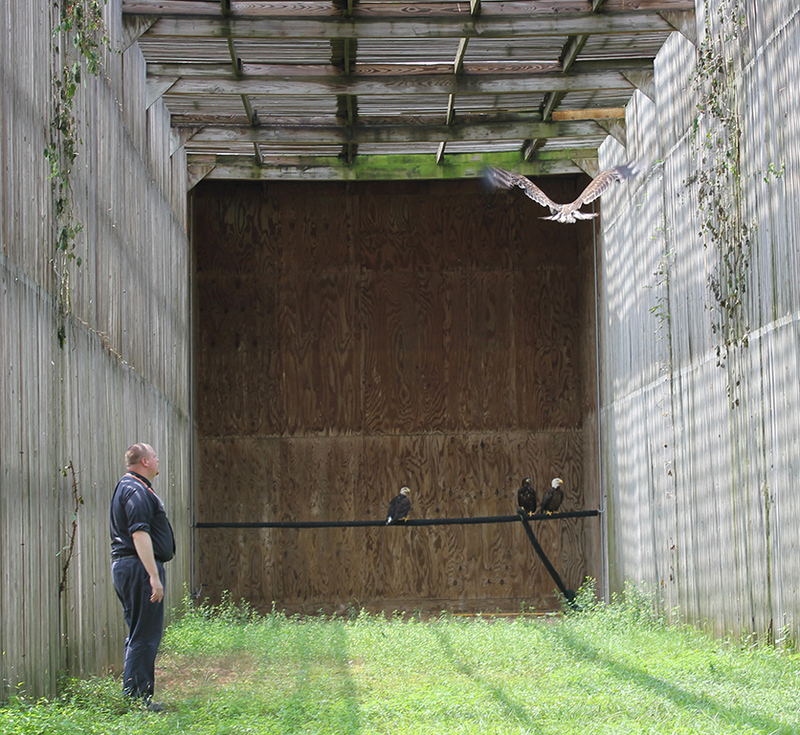 Home > CVM News > Young Bald Eagle to be Released Aug. 15 in Tift County, Ga.
Young Bald Eagle to be Released Aug. 15 in Tift County, Ga.
Dr. Seth Oster watches the young bald eagle fly in one of the aviary facilities at the Southeastern Raptor Center. The Southeastern Raptor Center, in conjunction with Georgia Wildlife Rescue Association, will release a juvenile bald eagle Saturday, Aug.15, in Tift County, Georgia. The release will take place at 2 p.m. EST at Paradise Public Fishing Area, 536 Paradise Dr. in Enigma, Ga. The bald eagle, believed to be two-to-three years old, was brought to the Southeastern Raptor Center June 5 because it was “emaciated and weak,” said Dr. Seth Oster, an assistant clinical professor and avian veterinary expert at the Auburn University College of Veterinary Medicine and the SRC’s primary veterinarian. SRC staff treated the eagle and provided supportive health care. Because it was not injured and can survive back in the wild, the goal was to release it. Since the young eagle had not established territory or chosen a mate, authorities decided to release the eagle in a location optimal for its survival. “Paradise is literally ‘paradise’ for a young eagle,” said Chet Powell, executive director of the Georgia Wildlife Rescue Association. “It includes more than 70 lakes and ponds on protected property so there is abundant food, water and habitat, and it is well within the flying range of where it was recovered. 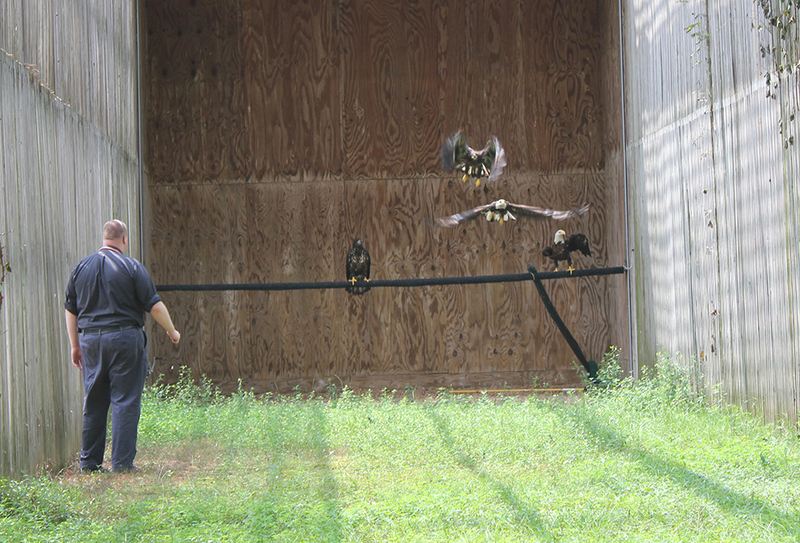 Dr. Oster watches the eagle fly, the lower one in flight, to ensure it is ready to be released. Before it was brought to Auburn for care, several Georgia organizations were involved, including the Georgia Wildlife Rescue Association, Georgia Department of Natural Resources and the U.S. Fish and Wildlife Service. Dr. Larry Branch of Branch’s Veterinary Clinic in Tifton, provided the immediate life-saving care. He transferred the eagle to the Southeastern Raptor Center. The mission of the Southeastern Raptor Center is wildlife conservation, education and rehabilitation. Since its inception in mid-1970s, the Southeastern Raptor Center has rehabilitated and released thousands of injured birds of prey and educated more than 1 million people about raptors and other wildlife. Best known for the pre-game flight of the eagle in Jordan-Hare Stadium, a uniquely-Auburn experience, the SRC is a division of the Auburn University College of Veterinary Medicine.